Writer. Born: July 12, 1827, Belchertown, Massachusetts. Died November 15, 1911, Lawrence, Kansas. 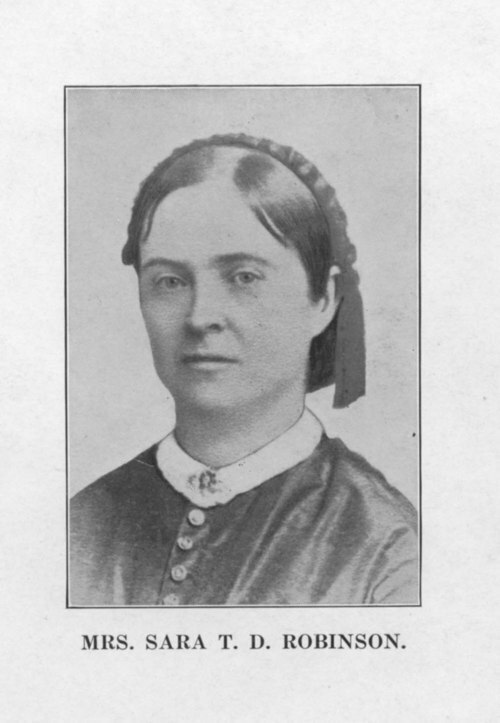 The daughter of a prominent Massachusetts lawyer and distant relative of Amos Lawrence, a Boston industrialist and philanthropist, Sara Tappan Doolittle Lawrence was born in Belchertown, Massachusetts, on July 12, 1827. She received a classical education during her childhood and attended the New Salem Academy. “By the age of twelve,” wrote historian Don Wilson, “she was an excellent Latin scholar and could read German and French fluently.” In 1849, just before he left on an expedition to California, Sara Lawrence met and began seeing Charles Robinson. The couple married on October 30, 1851, soon after he returned and established a home in Fitchburg where Charles Robinson edited a newspaper and practiced some medicine. In the wake of his single term as governor of Kansas and the Civil War, the Robinsons remained in Kansas and Lawrence for the rest of their lives. The governor died in 1894, and Sara Robinson lived at their Oak Ridge farm, a few miles west of Lawrence, until her death on November 15, 1911. Charles and Sara T.D. Robinson had no children and eventually contributed much of their estate to the University of Kansas, including most of the land that the main campus of the university now occupies.